We have had a lot of new clients lately and unfortunately, a lot of them have been no-showing and cancelling at the last minute. Our friend, Holly, The FingerNailFixer created a great way to explain WHY we have a Cancellation/No Show Policy and WHY it is going to be strictly enforced in 2011. No more "Get Out of Jail Free Cards"
1. YOU, the client, do not receive the nail service and care that you need, which may result in service breakdown and costly repairs. 2. Other clients WHO NEED NAIL SERVICE AND CARE could not be seen because we scheduled that time for you exclusively. 3. OUR SALON loses because the nail professional that you were scheduled with is idle during your appointment time. 4. THE NAIL PROFESSIONAL loses because they are paid on commission. When they don't work, they don't earn a commission. Imaging showing up for work and being told "Sorry, between 1 and 2 we don't have any work for you to do. We previously HAD work for you to do, but the work didn't show up"
We schedule your time with us JUST FOR YOU. When you do not show up, or cancel with less than 6 hours notice, many people are affected. 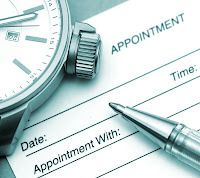 We can not find a client to fill your broken appointment on short notice and, as a result, you will be charged a fee, equal to half the amount of your missed appointment, which must be paid up front when making another appointment. If you NO SHOW an appointment, your fee will be 100% of the service missed. Six hours notice to cancel or change an appointment is more than reasonable. Most salons and doctors offices require 24 hours notice. We trust that you will be here for the time we have scheduled just for you. Thank you for allowing us to care for your nails and for being so understanding in this matter.